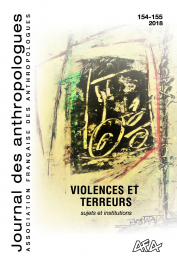 The main aim of the Journal des Anthropologues is to encourage the distribution of recent anthropological work concerning the transformation of the contemporary world and the new research objects. Each issue is based on a comparative perspective, bringing together research in a variety of cultural areas. There is analysis of the discipline’s practices and evolution, also from pluri-disciplinary points of view. Careful attention is paid to epistemological aspects and fieldwork. With these directions in mind, the journal’s editorial committee has published works by well-established researchers as well as young researchers exploring new fields of enquiry. De nouvelles subjectivations du(es) / au travail ?